The 980-passenger Crystal Serenity takes the best of big-ship cruising and the best of luxury travel, and combines them to offer passengers an upscale experience with lots going on onboard. 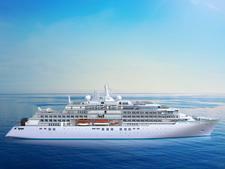 By the standards of the other all-inclusive luxury lines, Crystal Serenity is a big ship. But its high space-to-passenger ratio means that lounges and restaurants are spacious and plentiful, and there's room to offer a wide range of activities on any given sea day. Crystal is top of the luxury list when it comes to enrichment and entertainment. Any given night could see two live performances in the ship's theaters, a movie in the onboard cinema and live music in three different lounges; any day might have multiple guest speakers (including some big names) and workshops on bridge, art, golf, ballroom dance and digital technology. 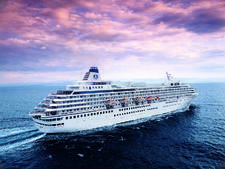 Yet Crystal does not give up its high standards to accommodate hundreds more passengers than other luxury lines. Service is attentive and often personal -- as you return again to the ship, or even to a favorite bar, the crew will quickly get to know you. Dance hosts are onboard to make sure solo travelers have someone to dine and dance with. Dining is a highlight, especially in the signature specialty restaurants, such as chef Nobu Matsuhisa's Umi Uma and Sushi Bar, and the Italian Prego. The ship is not new, having launched in 2003, but a 2018 refurbishment did much to modernize the ship and eliminate a few pain points. Smaller cabins were combined into new suites, with a chic new look and some of the best showers at sea; this not only gave travelers additional suite accommodations but reduced the total passenger count to take pressure off dining and other public areas. Waterside, the main dining room, got a modern makeover and new dining options -- the Asian Silk Kitchen, Brazilian Churrascaria and Stardust Supper Club -- were added to increase restaurant choice and spread guests out in the evening. The big policy change that accompanied the refurbishment was the elimination of set-seating, set-table dining. All venues now function like restaurants, with first come, first served dining in Waterside and the Churrascaria and a reservations system, as before, in the other specialties. The result is a ship still loved by Crystal loyalists, who want to be served by their favorite waiters and bartenders, and enjoy cabins with bathtubs and a classic look, but one that also can be embraced by younger travelers looking for craft cocktails and modern design, luxury cruisers who crave that high space-to-passenger ratio and even seasoned mainstream sailors looking to move up to luxury without sacrificing activities and entertainment. Crystal passengers are generally an empty-nester crowd, especially on unusual itineraries like World Cruises, where longer itineraries attract those who clearly have the time (read: retirement) to take the longer sailings. However, due to Crystal's kid-friendly policies (for a luxury cruise ship) and kids-sail-free deals on select sailings, it is not surprising to find at least a handful of children aboard, especially during the summer, holidays and school breaks. Crystal cruisers are extremely loyal; on our cruise, roughly 500 of the 800 passengers onboard were repeaters. First-timers are welcome, but don't be surprised when guests and crew alike already know each other. The majority of passengers are Americans -- even more so on sailings based out of or close to the U.S. Canadians, Brits and Australians are the next largest demographic, with an international mix rounding out the rest. Because Crystal's parent company is based in Asia, you will also spot a number of Asian travelers, as well. Crystal has always been a formal cruise line, but the dress code has relaxed some. On most nights the dress code is "Crystal Casual," meaning dressy slacks, skirts or dresses for women and collared or button-down shirts for men, no jacket or tie required. While jeans aren't encouraged, they aren't expressly forbidden on casual nights either. Expect only a few Black Tie Optional evenings -- some short cruises won't even have one -- where you certainly may wear your tuxedo or gown, but most ladies will dress up in cocktail dresses or fancy separates, with the men in suits or jacket and tie. Although jackets are technically required, we saw a few men dressed smartly but without a jacket, and they were not kicked out of the main dining room. Seven-night or shorter itineraries will only have Crystal Casual nights. Expect one or two Black Tie Optional nights on cruises up to two weeks; longer cruises vary dress codes based on itinerary and any special events. Be sure to check Crystal's information center for booked passengers to find the specific dress code schedule for your sailing. During the day, passengers dress for the weather and activity in comfortable clothing. Crystal Serenity's fares include all alcoholic and nonalcoholic beverages (excluding ultra-premium wines and liquors), gratuities, unlimited Wi-Fi on one device per passenger at a time, use of self-serve launderettes and fitness classes. Most dining venues are free of charge; passengers in standard cabins can eat once for free at Umi Uma and Prego, while suite passengers get unlimited visits. An 18 percent gratuity is added to all spa and salon purchases. The onboard currency is the U.S. dollar. Esprit, Crystal Cruises' first-ever yacht vessel, debuted in 2015. 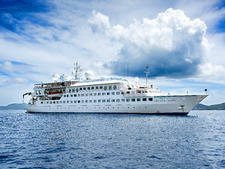 The 62-passenger ship, beautifully refurbished, resembles a contemporary, comfortable boutique hotel. Large luxury ship known for enrichment classes, inclusive fares, gourmet food and impeccable service; carries 922 passengers. This purpose-built Polar-class yacht pairs exciting destinations with all-suite accommodations, onboard amenities like helicopters, a submarine, aft marina, spa and fine dining venues for 200 passengers.